In Amelia, Icarus (the boy who flew too near the sun in Greek mythology), is a recurring character in Amelia’s dreams. We see him building wings with his father Daedalus in Act 1 Scene 2—initially in a dream, though they continue to prepare for their escape as the scene between Amelia and her husband, Paul, continues. Photos credits. 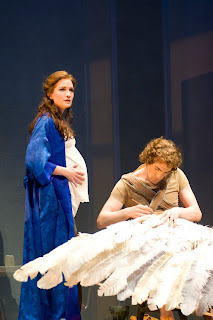 Top: Kate Lindsey (Amelia) and Nicholas Coppolo (Icarus). Bottom: Jordan Bisch (Father) and Nicholas Coppolo (Young Boy). All photos © Rozarii Lynch. For me Coppolo's hallucination aria in Act 2 was one of the high points of Amelia. 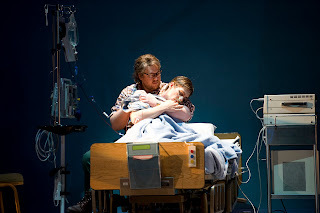 It had a dramatic intensity that I didn't always find in the storyline and libretto.